Photo by Dan Tubbs. James Buchmann as the narrator and Paul VandenBranden as Ralphie. Taking place just after the Great Depression in a small Indiana town, the 1983 movie A Christmas Story tells the tale of one young man's fevered quest for a toy firearm. It's quaint, blackly funny and a yule-tide classic. 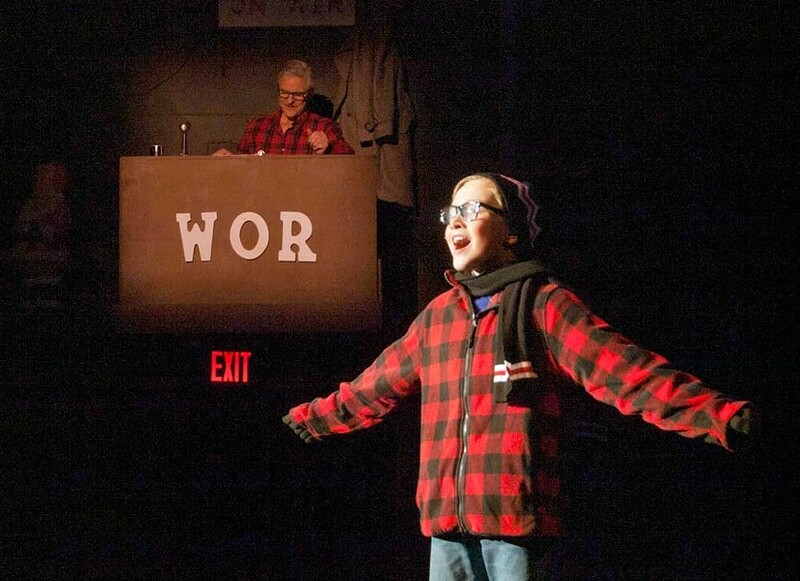 The musical reworking, A Christmas Story: The Musical, currently showing at the Ferndale Repertory Theatre, carries the burden of living up to an iconic movie with the extra weight of musical numbers that don't enhance the story. The show follows 9-year-old Ralphie Parker through Christmastime as he desperately angles to convince his parents to buy him a Red Ryder Carbine Action 200-shot Range Model Air Rifle, and his perfectly normal, Midwestern family in their day-to-day lives. The narrator, Jean Shepherd (the author of the source novel, whom I've always called "Old Ralphie," played here by James Buschmann), appears as a Garrison Keillor-type radio host. Perched above the stage, clad in plaid, he punctuates the musical numbers with humor, alliteration and a dulcet baritone. It's a clever twist that adds a depth to the show. Watching Buschmann look over the proceedings and react as though he is seeing it himself as he retells it gives the feeling of a story being at once created and remembered. Paul VandenBranden, who plays Ralphie, is awesome, holding the stage with the presence of a 30 year old. Two or three times in the course of the show he's up there alone, under a spotlight, singing his scarf off. The set design by Cecilia Beaton is excellent. The Parkers' rotating home is one of the more creative uses of space I've seen and the narrator's crow's nest is a stellar decision. And for a show that requires more than a few mid-scene set changes, the crew never once broke the sense of immersion on the night I attended. The costumes by Carol McWhorter Ryder are simple and effective, feeling well-worn and true to the period. Teaching grade-schoolers half a dozen different musical numbers with accompanying choreography must be a bit like herding cats but they are all crisp and well orchestrated. Melissa Hinz and every youngster who should be named but can't be for the sake of brevity, take a bow, please. This is an ambitious show and Ryder in her directorial capacity deserves copious kudos for putting it all together. To crib a famous Supreme Court justice, I find it difficult to codify exactly what constitutes "good direction" but I know it when I see it, and this was it. The Humboldt Light Orchestra provides live musical backing for the show from an unseen perch above the audience and is delightful (though I wish it had kept the "Peter and the Wolf" motif work). The film works because it finds a common thread in a small, unremarkable story. Every main character is little more than scaffolding, an archetype, playing a familiar part in a familiar way so viewers can write themselves into them. I once was Ralphie, young and singularly focused on a specific present. Parents who watched the movie with their spawn saw themselves in Mother and Old Man Parker: the burden of the holidays, the personal sacrifices made for their children's comfort and happiness, the waking up way too early to their children's unquenchable excitement and wishing you'd put coffee on the night before when you were stocking the tree. It's a grounded story that thrives in the commonality, the banality of it all. A musical communicates none of that. By their very nature, musicals are highfalutin, surreal experiences. They have overtures and jazz breakdowns. They're full of swashbucklers and rogues and artful dodgers and chintzy conmen from Gary, Indiana. The musical may not be the genre for a post-depression, middle-class family from Hohman, Indiana, whose one wish is a reliable Oldsmobile and a $50,000 contest prize. That said, this was not some meandering disaster. I never hoped for Ralphie to shoot my eye out and, unlike Ralphie's bunny suit, this was not a pink nightmare. The show hits all the high notes — "Fra-gee-lay," "I can't put my arms down," Flick with his tongue stuck to the frozen pole — but they don't stand out. Perhaps the foundation of a small, routine life can't support a musical. And no matter how good the rest of it is, the disconnect is too wide to bridge. Ferndale Repertory Theatre's A Christmas Story: The Musical plays Fridays and Saturdays at 8 p.m., and Sundays at 2 p.m. through Dec. 16. Call 786-5483 or visit www.ferndalerep.org. North Coast Repertory Theatre's funny, interactive show The 25th Annual Putnam County Spelling Bee runs Fridays through Sundays until Dec. 9. The shows on Nov. 30 and Dec. 7 are "adult shows" featuring stronger language. Parental guidance is recommended for children 13 and younger for all shows. Call 442-6278 or visit www.ncrt.net. Dell'Arte's holiday show Around the World in 80 Days makes its rollicking rounds on stages through Humboldt and beyond through Dec. 16. Call 667-3631 or visit www.dellarte.com. The Arcata Playhouse's annual holiday show puts the tale of the Prince of Thieves in sci-fe territory with Robin Hood Knight of the Stars – A Space-capade Dec. 6 through 15. Call 822-1575 or visit www.arcataplayhouse.org. Dell'Arte stays true to character with The Character Projects, original pieces from second-year MFA students from Dec. 6 through 9. Call 668-5663 or visit www.dellarte.com.